Everyone loves an egret. Known also as the White Egret, Great White Egret, American Egret, Common Egret, Large Egret, Great White Heron, and angel bird, Ardea alba is a familiar sight just about anywhere shallow water touches land. Although fairly common now, the great egret came perilously close to extinction at the hands of the hat trade at the beginning of the twentieth century; egret plumes were deemed a fashion accessory. 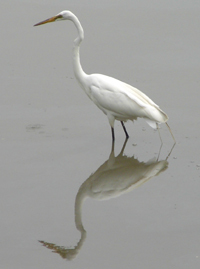 Today, the primary threat to egret productivity is destruction of its wetland and coastal habitat. Thankfully, there are those places, like Chincoteague NWR in Virginia, where the great egrets stretch as far as the eye can see. Pure genius! just picked up bird photography. Is there anyplace where i can share my pictures. Thanks. I am liking this hobby.